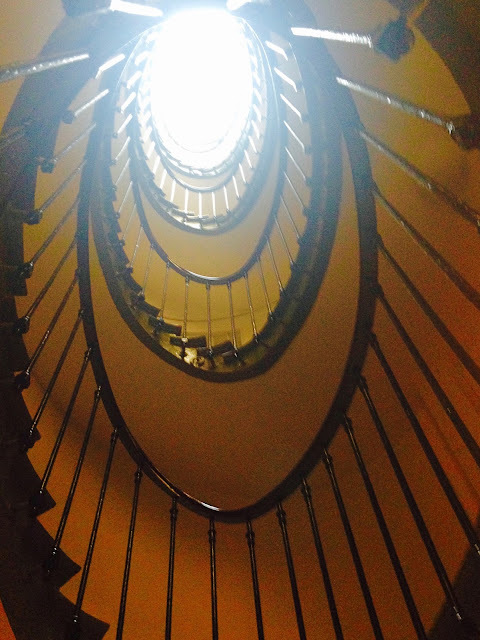 A spiral staircase in an old building on the Left Bank winds its way up to a ceiling that opens to the sky. 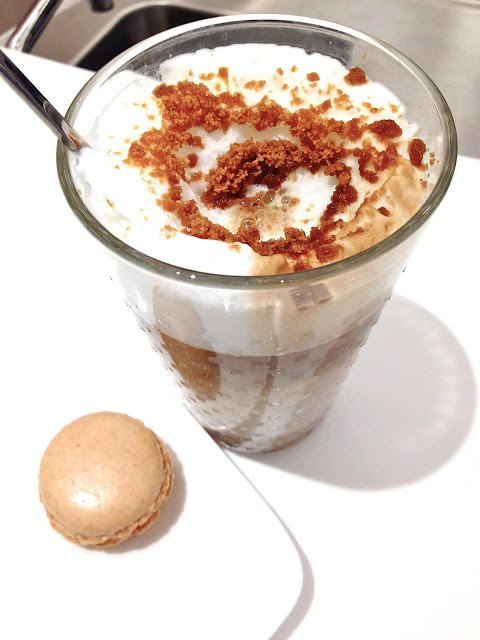 Wedged among chain stores on the Champs-Élysées the Nespresso Boutique surprises with excellent coffee in an upscale setting. 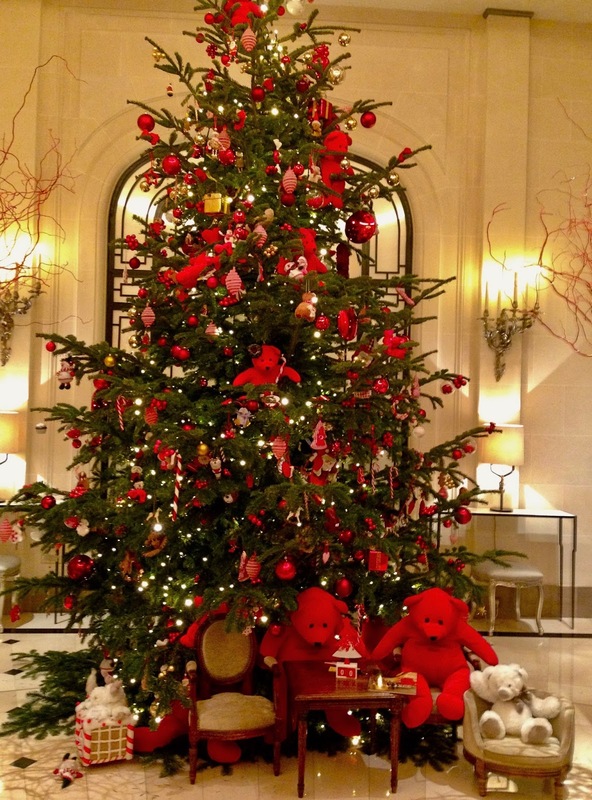 A tree decorated using small plush red bears of varying sizes as ornaments, with larger bears at its base for effect. 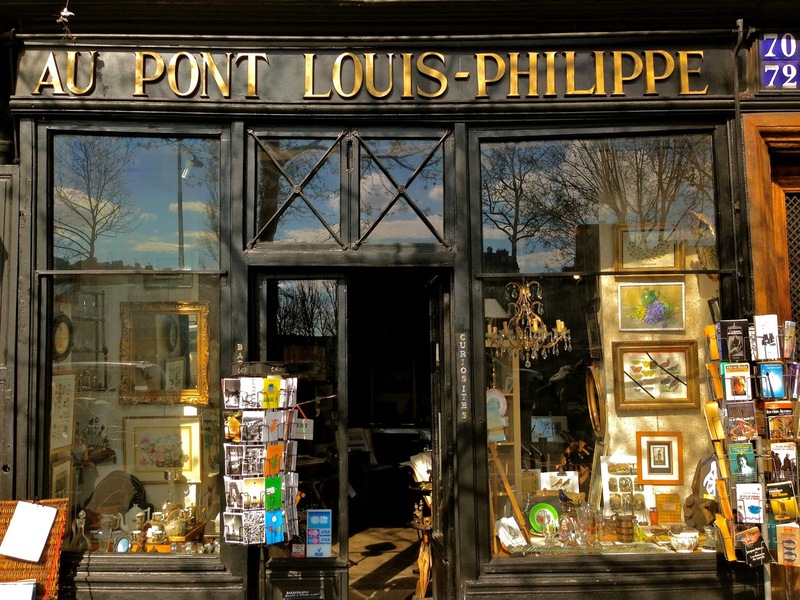 Bare trees lining the quai are reflected in windows of an antique shop facing the Louis-Philippe bridge. 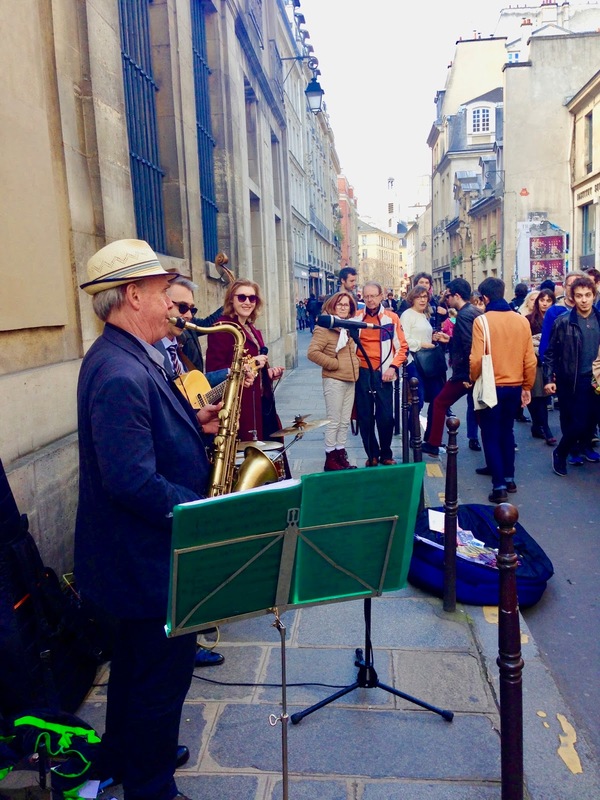 All over France, Christmas Day lunch is a quiet family affair. 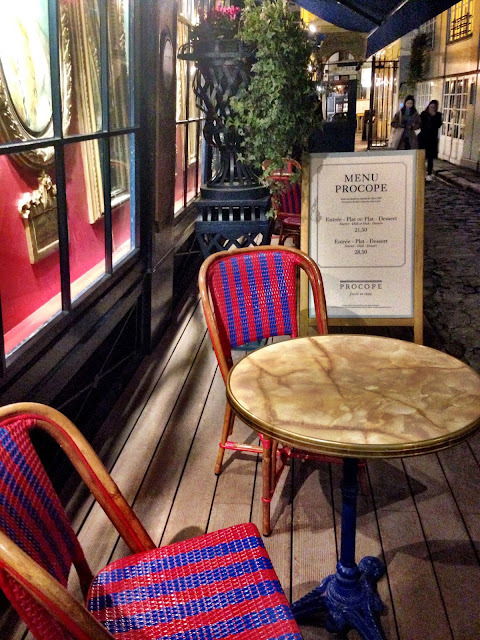 I love it all, from helping create the menu and set the table to the long conversations that extend into the evening. On the menu: apéritifs / gourmet nibbles in front of the fire; at table: foie gras fresh figs starter, roasted confit de canard and wild mushrooms, mixed salad with toasted pumpkin seeds and orange, farm cheeses. Green apple sorbet verrines with vodka and fresh mint made a light prelude to traditional yule log cake. And to finish up properly, espresso / tea followed by an assortment of digestifs. Feeling festive and in a holiday mood Parisians hit the streets. Luxury Hotel Plaza Athénée all dressed up and ready for the holidays. A sparsely decorated Christmas tree inside the entry of a church. Inside Le Train Bleu leather armchairs line a long hallway that leads to the ornate dining room. Traditional Yule Log cakes along with candied chestnuts are starting to fill bakers' shelves. "Happily, one-of-a-kind bookshops are alive, well, and thriving in Paris..."
A Paris kiosk gets its posters replaced. Hermès' signature orange is incorporated into this winter bag and matching gloves. Approaching medieval fortress castle the Conciergerie a.k.a. 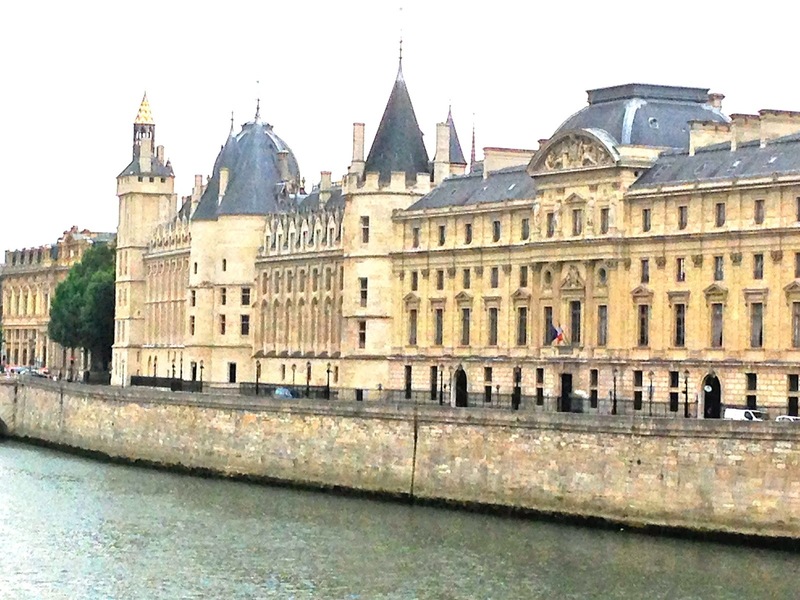 the Châtelet by boat. 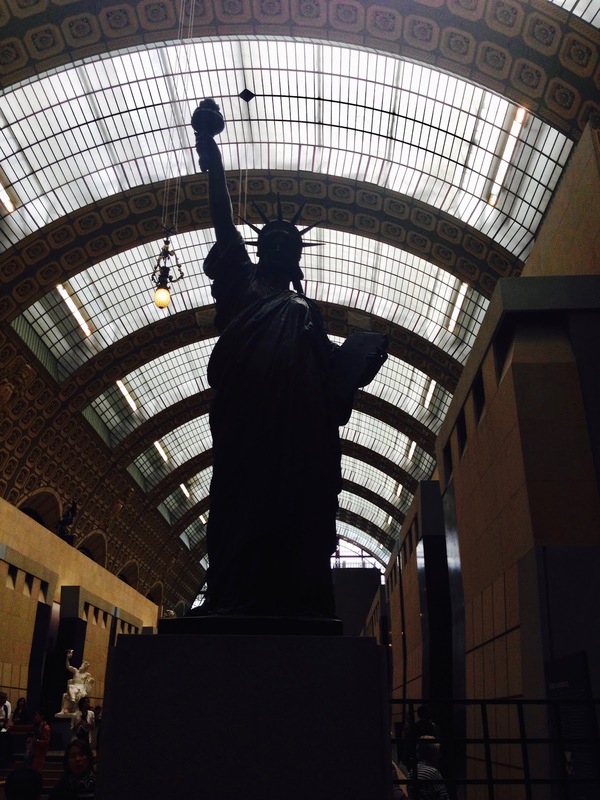 Yet another of Frédéric Bartholdi's Statue of Liberty, this one inside the Orsay Museum. 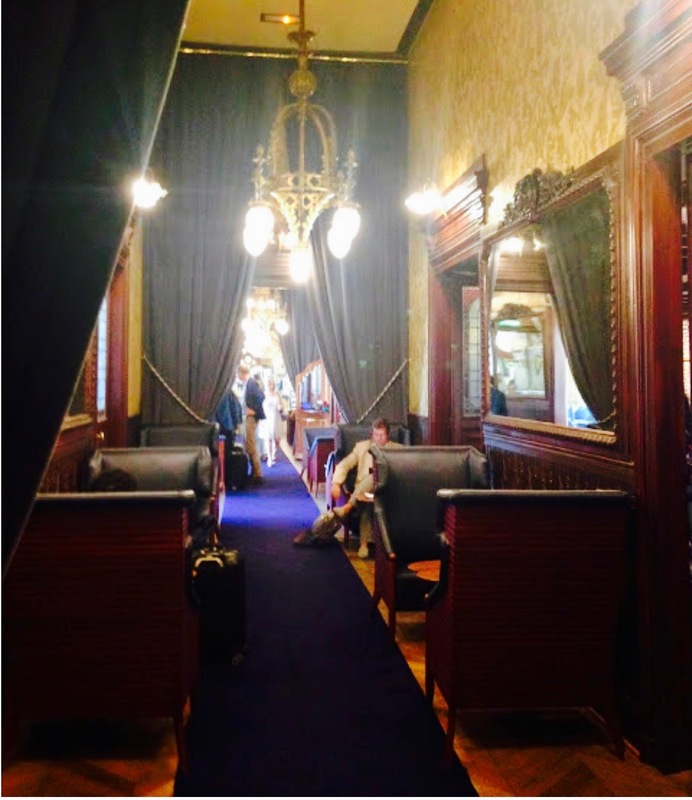 A Statue of Liberty, one of several throughout the city, greets visitors to the Musée des Arts et Métiers. This life-sized crèche from Eastern Europe is one of many set up in churches across the city. One of Montmartre's longest and steepest stairways is next to the Funicular. 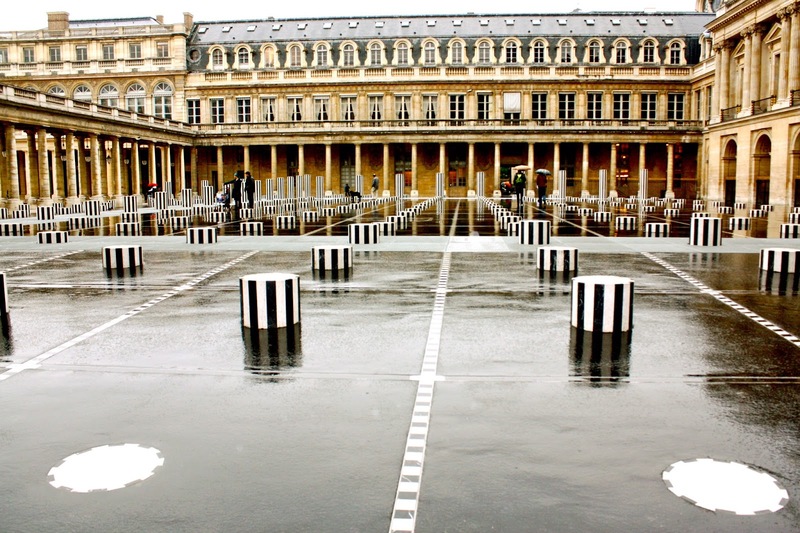 Reminders that Paris' mid-winter opera season has arrived are popping up everywhere. Croquantes and enormous, these shiny meringues are waiting to be taken home. A small designer boutique creatively uses cutout masks, pom poms, scarves and hats as faces for its displays. 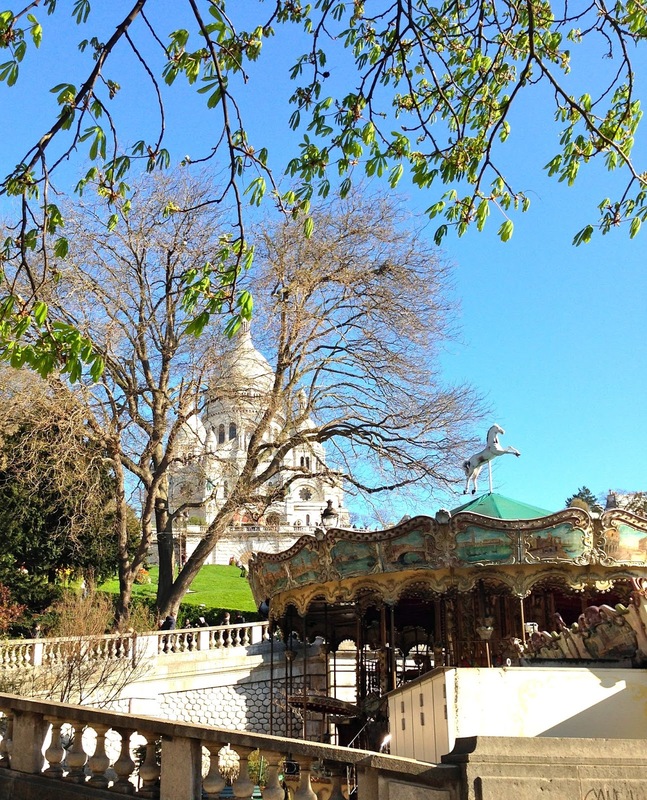 Postcard view of the Basilica of Sacre Coeur over a carousel in the foreground. A shop near Sacre Coeur sells many kinds of perfume flasks. 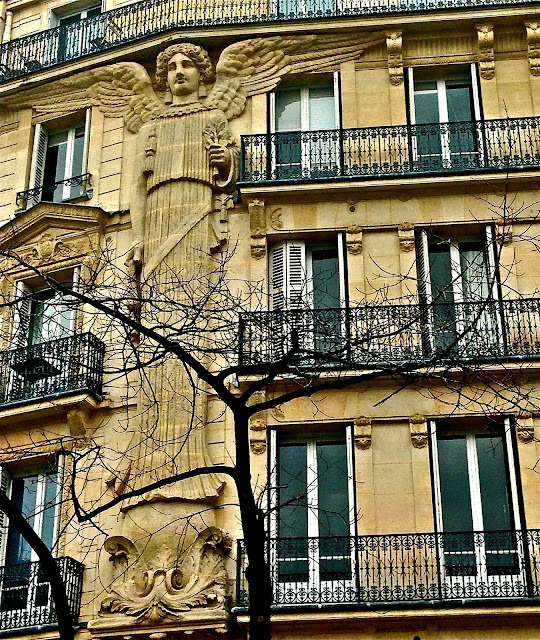 Statue of the famous Huguenot on Place Félix Desruelles next to church of Saint-Germain-des-Prés. A neighborhood pâtisserie displays its weekend dessert selection. 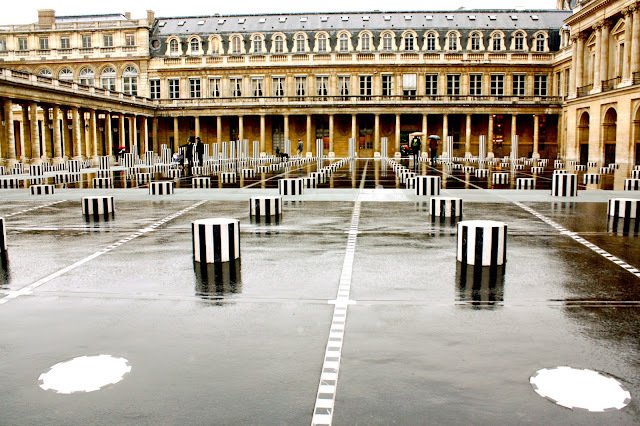 Daniel Buren's columns at the Palais-Royal shine no matter what the weather. 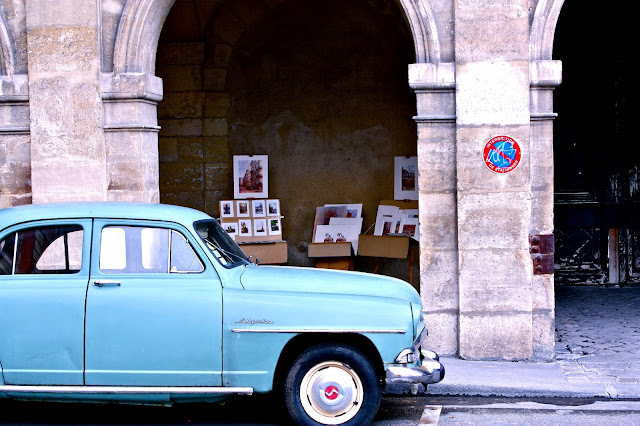 This photo taken on Place des Vosges reminds me of something you'd see in Havana. A colossal angel on a building on rue Turbigo spans three floors. 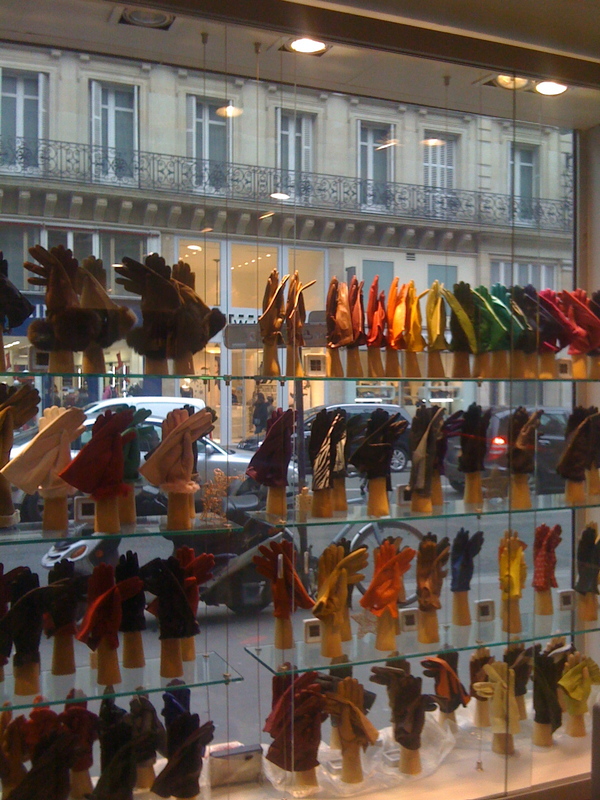 View from inside a shop that specializes in gloves. 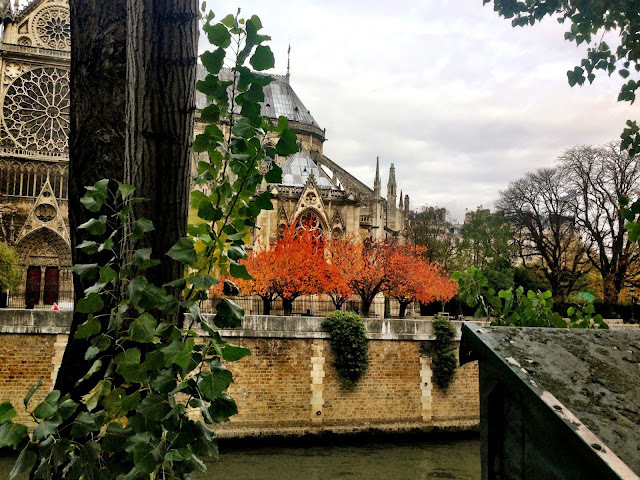 "The world is yours" written uncharacteristically atop Paris' Odéon-Théâtre. 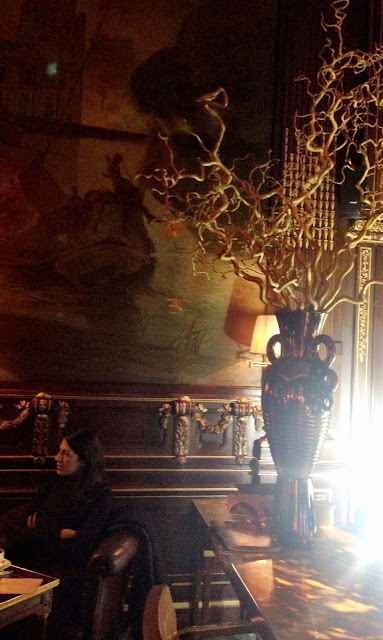 Pre-Thanksgiving toast of Champagne cocktails in the bar at the Hotel Meurice. 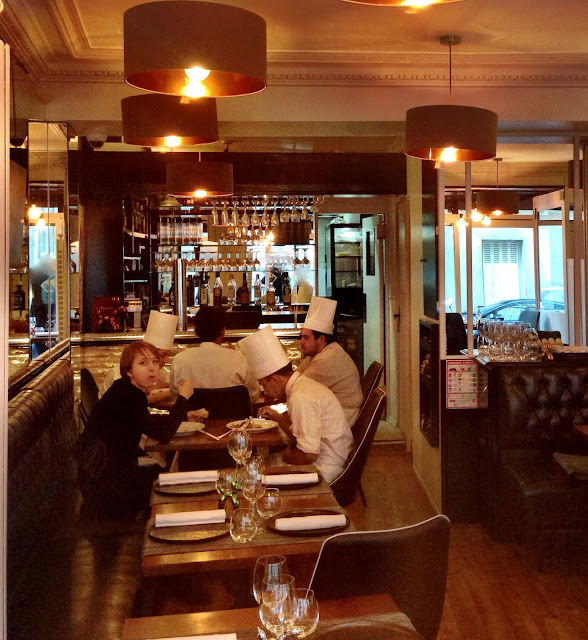 Cooks and staff partake of an early lunch before customers begin to arrive, a daily ritual in Paris restaurants. 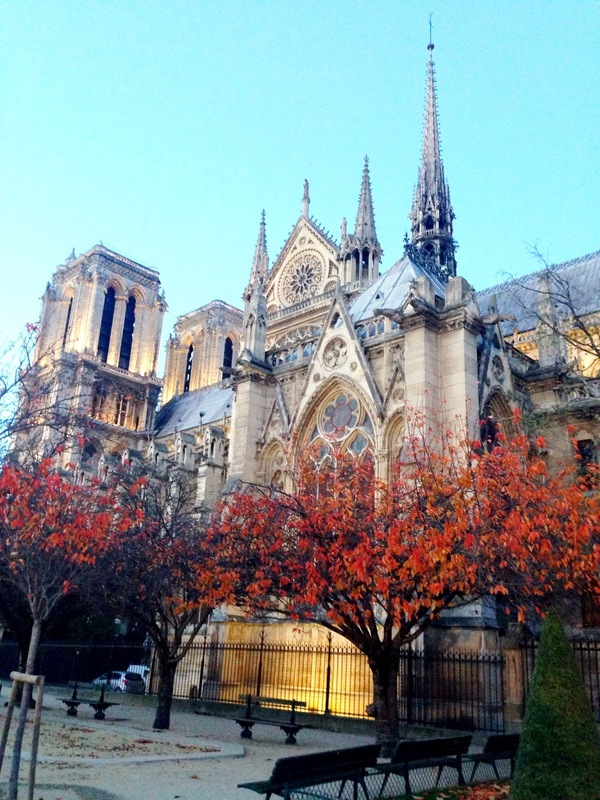 Dresses seem to float in a tiny Left Bank boutique. 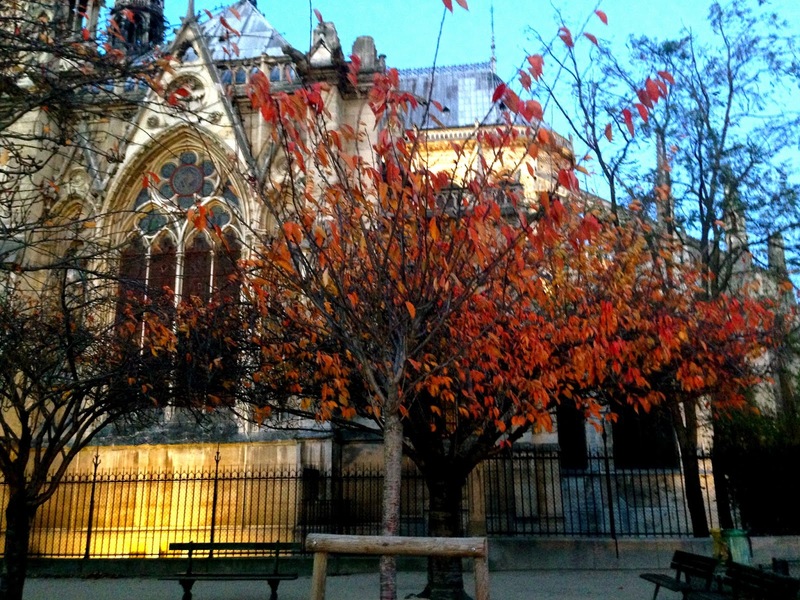 Bright orange leaves against the cathedral. Closer up, this tree bursts with color but it won't last long. A touch of autumn holds out along the quai next to Notre Dame Cathedral. Just vacated table in passageway behind Le Procope restaurant, founded 1686, late at night. 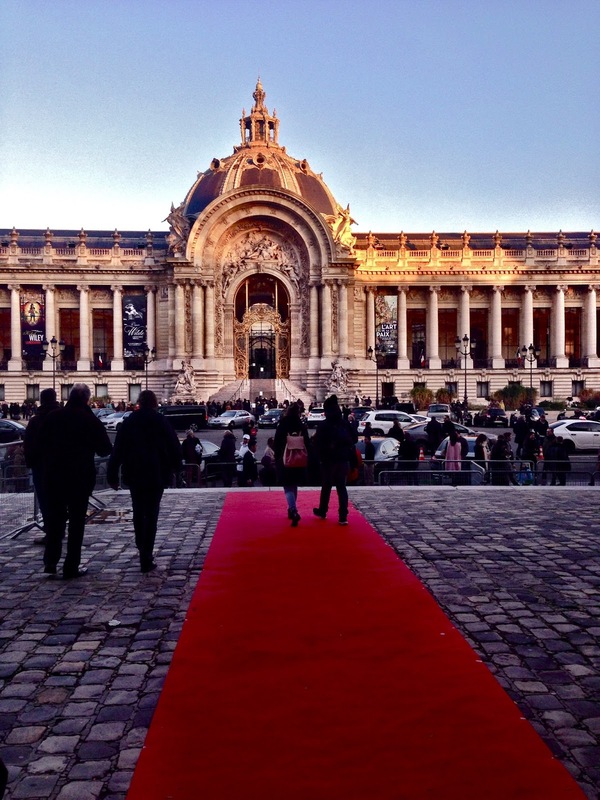 Leaving the Grand Palais after a red carpet event. Across the street, the Oscar Wilde exhibit at Le Petit Palais. I liked the worn-out chairs and cartoonlike paintings above the sign of this rickety café in the old Les Halles district. A playful array of sweets and pastries set out at luxury 5-star Peninsula Hotel.